– All applicants must be registered with ASC prior to submitting a scholarship request application. Request application must be submitted with all appropriate documentation. Players will have less than two weeks to find sponsors to donate a $ amount for each time that a player touches a soccer ball. The goal will be for each player to touch the ball 200 times a day from 11/4 to 11/23. So if I pledge $1 per 200 touches for a player on the Bulldogs and they complete the challenge, I would donate $20. As the method is optimal to encourage touches on the ball for each player, sponsors may also pledge a dollar amount without that player completing their goal. 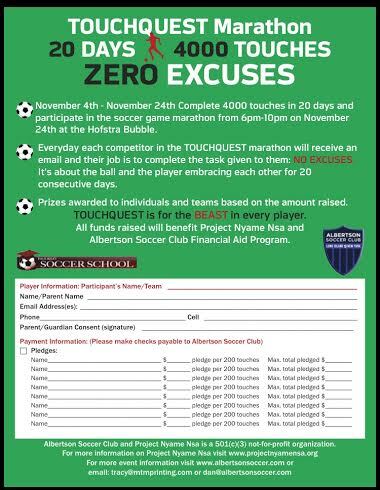 In order to register for this, sponsors would need to go to our website www.albertsonsoccer.com and click on the tab on the on the left hand side that says 4000 Touches (New). This will direct them to register themselves and who they would like to sponsor. It will then prompt them to pay via credit card or they can also pay by check, and those can be collected and sent to the team representative or manager along with the pledge sheet. Checks must be made out to Albertson Soccer Club, they should have the person they are sponsoring on the check as well as the team they play for. Project Nyame Nsa seeks to build a Village 0f Hope that will provide holistic (spiritual, emotional, psychological, and physical) well being to orphans and highly vulnerable children in Ghana, Africa. This project is the brain child of a former Albertson Soccer Club family. Seeks to provide financial aid to those players who are in need. It Is an opportunity for each team to help offset tournament and training costs and allow those who cannot afford to participate in the program. Soccer related games will be played with prizes awarded. There wit be a Chinese & silent auction also.